Did you know that over 700 alumni give back to the BSC every year? BSC Thankathon is when we thank them and hear great stories about their experiences in the BSC. Sign up for a two-hour shift here. These are NOT fundraising/solicitation calls! We thank our alumni donors, learn why they value their BSC experience, and answer questions about the BSC. EASY, EFFECTIVE, and FUN. Note: Use BSC Thankathon to satisfy Community Improvement hours! CO can also offer central-level workshift credit. You can ask your workshift manager to allow the caller to use this opportunity to work off down hours. This is not a paid workshift. LOCATION OF BSC THANKATHON: Cal Calling Center 2440 Bancroft Way Suite 111, Berkeley, CA 94720 (located beneath The Career Center). 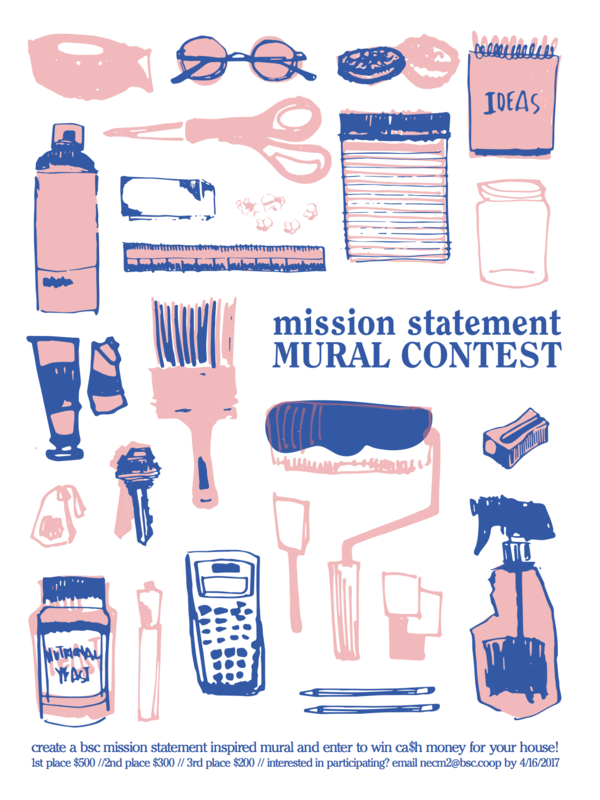 Board is happy to announce the first ever BSC Mural Contest! We’re not 100% sure it’s the first ever (we’ve been around for a long time, so who knows…), but either way it’s new and exciting! The theme of this contest? The BSC Mission Statement. 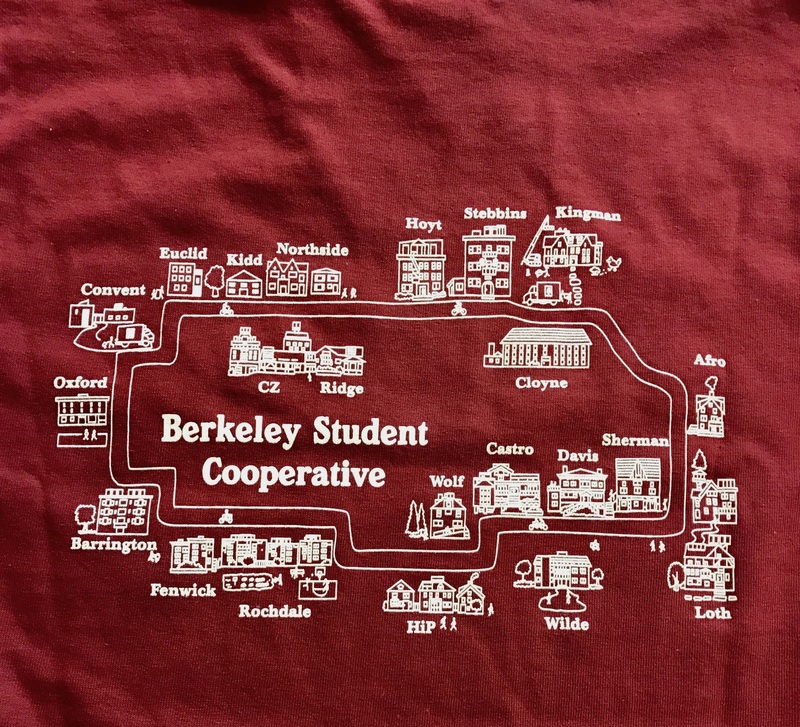 And if you don’t remember, our mission is to, quote, provide a quality, low-cost, cooperative housing community to university students, thereby providing an educational opportunity for students who might not otherwise be able to afford a university education. Do you know a co-oper that deserves to be recognized for being cooperative? 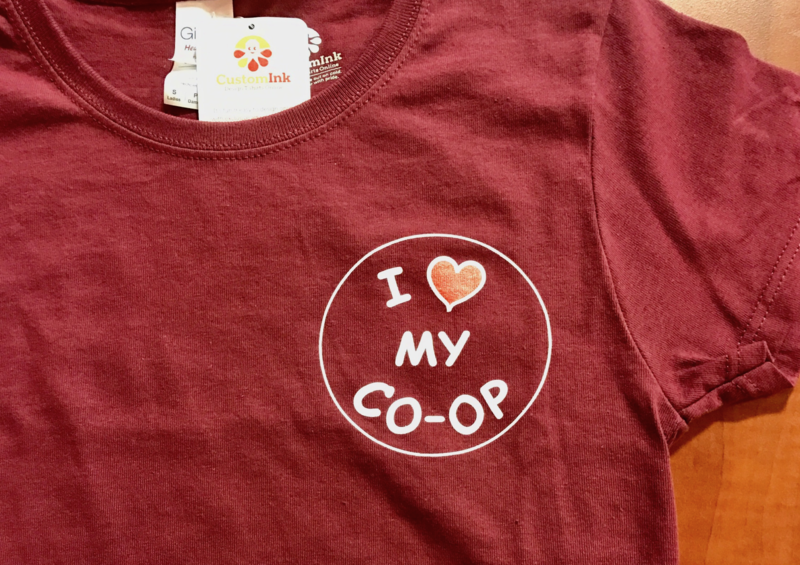 Maybe you know someone that goes above and beyond to make your house a cooperative and works well with others. 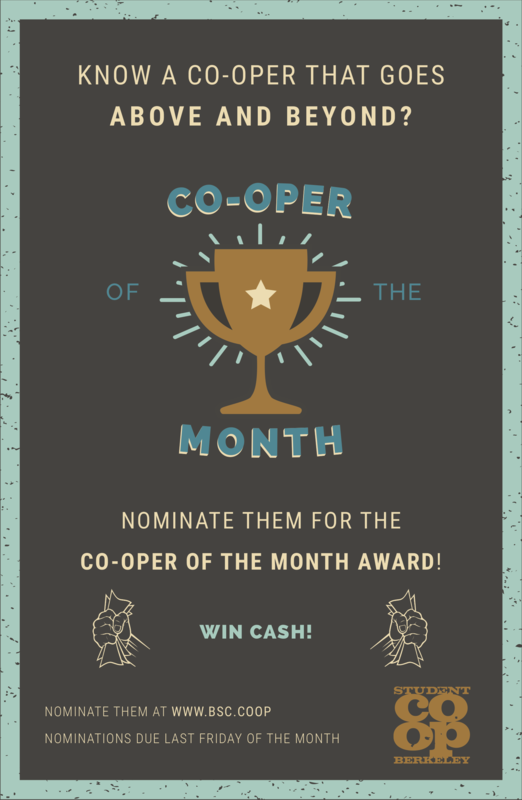 Nominate them for the Co-Oper of the Month Award! A new co-oper is selected every month and wins a cash prize! Berkeley Hillel has an amazing new Israel opportunity that is open to any Cal student. It's a multi-narrative, educational trip to Israel and areas of the Palestinian authority. The goal is to shed light on the complexity and nuance of the Israeli-Palestinian conflict by visiting different places and hearing from different voices. The trip will be this summer! June 4th-14th and is almost entirely subsidized. Do you have any friends, peers, or classmates that would be interested in this trip? We are looking to put together a trip with individuals of diverse interests and backgrounds that represent a wide variety of Cal campus life. Sound interesting? The deadline to apply is Monday, March 20th. Time commitment: Training on April 1 from 11:00am-2:00pm. Volunteers will learn about water safety and the lesson plan during the training. Volunteer for at least 2 shifts. No lifeguarding/swim instructor experience required.